Did you know that you can get professional clipart images and stock photos to use free of charge in your research papers, posters and PowerPoint presentations? Even if it is in restricted-access papers that could be interpreted as commercial use? 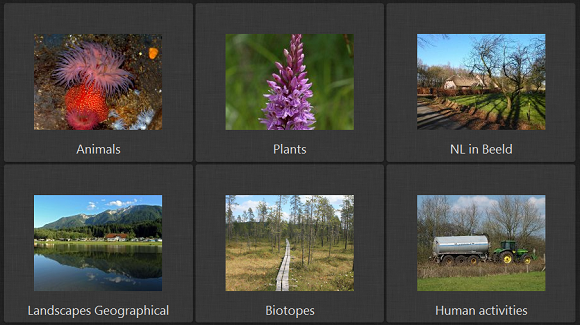 Below we present a selection of free image repositories with scientifically-appropriate content, which is especially convenient to use in graphical abstracts. We added notes on the terms and conditions of use, so that you can be confident you’re using the material in the right way. However, always check the journal’s policy on figures and graphical abstracts before using third-party content. Some journals, for example Environmental Science & Technology, clearly state in their Guidelines for Authors that only graphical abstracts created by the authors themselves are acceptable and no online material should be used, even if it is in the public domain. If you are a typical scientist, then one of the programs you use the most is PowerPoint. 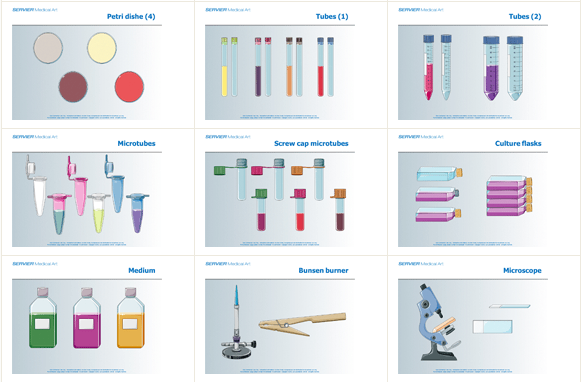 Servier, a French pharmaceutical company, has done a great favor to scientists by hosting a free science clipart collection, called PowerPoint Image Bank, on their website. The images are high-quality, professionally designed, and PowerPoint-ready. You can download them enclosed in PowerPoint presentations and then simply copy-paste them to other MS Office files. Users’ License: There are no strings attached – Servier explicitly states that you can use the images to make your own PowerPoint presentations or to illustrate your scientific publications. 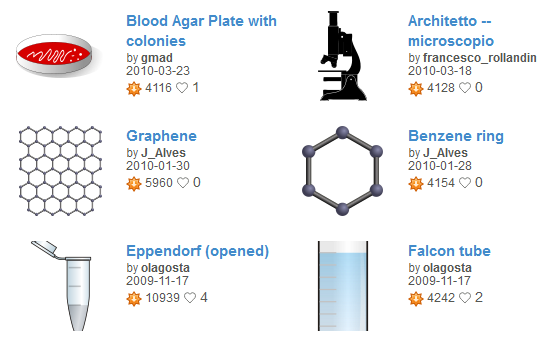 Openclipart is the largest online free clipart repository featuring over 100.000 items. Because everyday images predominate, some time is needed to find images appropriate for scientific purposes. Nevertheless, the large selection of free clipart is well worth the effort. Users’ License: The use of Openclipart’s images is unlimited for both non-commercial and commercial purposes. Clker is another usfeul free clipart repository, similar to the Openclipart. However, the images are more specific and better categorized, so for a scientist this webpage is more easily searchable. 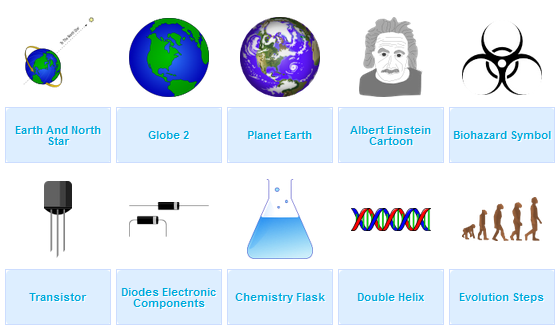 The selection of quality science clipart is high. Users’ License: All items are released under the creative commons CC0 public domain dedication and are available for both non-commercial and commercial use. Freerange is a free stock photo repository. Photos are the work of the Freerange’s in-house photographers and archives or are voluntarily contributed by a community of photographers. All of them are of professional quality. Image download is supported upon registration to the website. Users’ License: Both non-commercial and commercial use of the photos, except their redistribution, is supported. It is appreciated (but not required) to credit the website and the photographer as a courtesy. Saxifraga Foundation is a network of European nature photographers, whose aim is to stimulate and facilitate the conservation of European biodiversity. They do so by providing high-quality nature photos free of charge. The photos are aimed for use in PowerPoint presentations and on websites. Users’ License: You can download photos free of charge on the condition that you mention the name of the photographer (available in the filename) upon their use. As a courtesy, you are invited to send an email to the Saxifraga Foundation when you download photos and mention for what purpose you want to use them. Downloads for commercial purposes are strictly forbidden, but the use for printed publications on nature conservation can be made available upon request to the Saxifraga.